There are just a few places in the world where one can experience such an abundance of nature\'s beauty and luxury as found at Puerto Cito in Costa Rica. 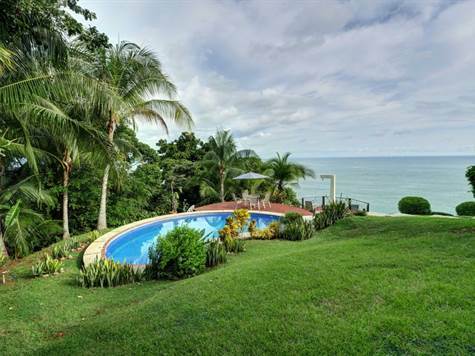 It is located in a pristine environment with evergreen lush rainforest vegetation with crystal clear Pacific sea along the shoreline in front of the property. With 19 acres of the hilly jungle around you, there is ample room to create an upscale hotel, a retreat center, a community of cabanas, or other possibilities of commercial tourism. Dominical is a strip of beach that stretches over 4km, with several hotels and restaurants. Guests should come with binoculars while you are waiting for the swells to grow and take in some of the hundreds of bed species that can be cited in the lush forest greenery and palm trees that encroach upon the beach. Aside from this, it is located close to the Ballena National marine park and Nauyaca Waterfall and Osa Mountain wildlife sanctuary, a world-class destination for both local and international tourists that are all your potential guests. From this area, your guests get to enjoy world-class tour experience such as fishing, dolphin-watching, scuba diving, jungle night tours, bird watching. It is this features that set the home apart as a jewel in paradise. The vast view of the ocean that you see from the living room and decks once you enter the house, from the white water coastline to the horizon in a broad arc of infinite beauty is a sight to behold. The home itself was created with old world charm, different from any other design in the area. Located on a cliff of aerial view advantage, the property also features beautiful landscaping, paved paths for walking between the upper and lower levels of the property, ample parking lot for guests. The area has an unspoiled beauty and natural charm with overwhelming appeal. There is a tower where you can climb into a second-floor personal space with those same views and total privacy for guests. Although there is a small, unobtrusive guest bedroom in the home, the master suite is the main attraction with its large closet, en-suite bathroom to make any guest comfortable and satisfied. There is also a tower where you can climb to a second-floor personal space with those same views of nature\'s beauty. A second two-story home on the property offers guest accommodations separate from the main house. The upper floor has a full kitchen, bedroom, and bathroom. The lower floor has a bedroom and its own bathroom. The cool evening breeze that comes from the evergreen tree canopies will make any guest want to revisit. The property site is the perfect place for a memorable vacation, habitation, and relaxation. It is situated in a highly bio-diverse area. The property is definitely the best idea of a world-class natural area for a hotel, Ecolodge, Break and breakfast. This wonder is located close to Costa Rica\'s reputable National parks and it is celebrated for its incredible biodiversity, a hotspot for nature lovers and conservationists. •	The property has four bedrooms with each bedroom having a bathroom, kitchen and dining room. •	There is also the provision of ample parking space to accommodate at least four vehicles of guests. •	With a dimension of 1743.8 sq. ft. and 24281.00 sq. m floor and land premise area respectively, it sure has more than enough space for you and yours! •	The jungle view and ocean view are good for the mind and eyes. Getting to see these sights is both refreshing and soothing for visitors. •	Concrete stairways from the home to the beach shoreline for guests\' sight-seeing. Apart from the development potential of this property, since it is located in an area of high demand, other hotel structures can be built on the massive land area as a development site to expand the already existing structure. There is ample room to create an upscale hotel and other man-made attractions that will cause tourist and guest influx from the already existing one With this feature, guests would not ask for more to have absolute satisfaction and utility for their money and time. Harnessing the hotel potential of this realty will be of absolute economic advantage. For serious potential buyers, please, contact us for a personal tour of this property and clear all doubts. The sale of this realty is a rare opportunity to own a world-class property in one of the most serene, unique and economically profitable areas on earth!